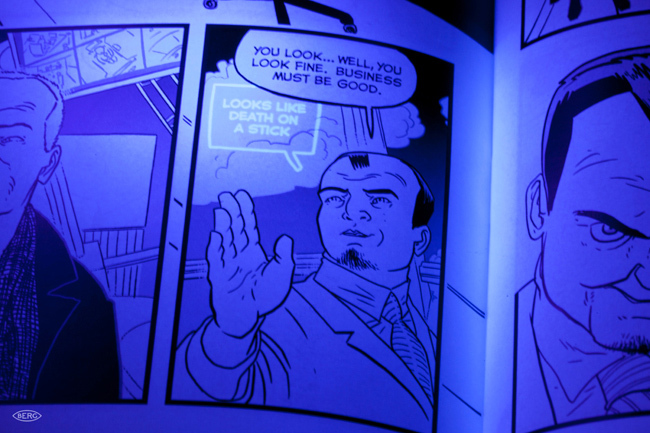 The designers at BERG teamed with the comics superstar Warren Ellis to create a comic where extra story points are revealed under ultraviolet light. At a time when comics are being shaken up by new media just as much as the music industry was lo those many moons ago, leave it to BERG to figure out a way to liven up the dead-tree experience most of us nerds still love. 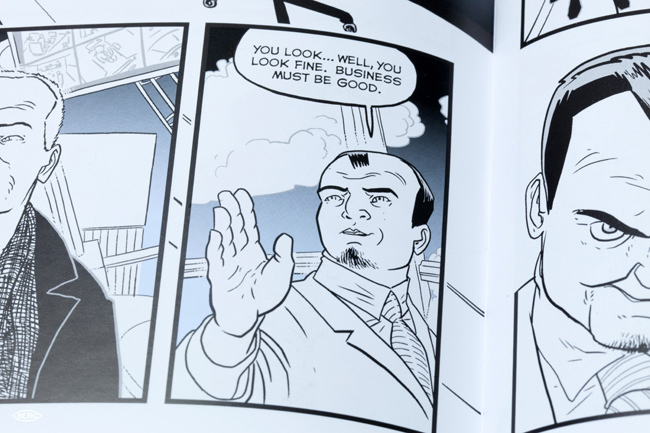 They’re publishing SVK, a new graphic novel that has Lost-esque easter eggs built right into its pages: Shining UV light on the pages “unlocks hidden layers of the comic,” they say. And just so you know it’s not some lame-o gimmick, it’s written by Warren Ellis and illustrated by Matt “d’Israeli” Brooker — two creative heavyweights that no comics fan can deny. As for what “SVK” is about, you’ll have to buy it online to find out — but according to BERG, “[it’s] a modern detective story, one that Ellis describes as ‘Franz Kafka’s Bourne Identity‘.” (Sounds pretty awesome.) The illustration style is my favorite kind in comics: flat and brutal but just slyly cartoony at the same time. And if you wave a tiny blacklight — which comes with the book — over the panels, you’ll see the characters’ hidden inner thoughts appear in UV ink, rendered with Ellis’s trademark acid wit. Given Ellis’s proclivity for dystopian futurism and BERG’s penchant for weird techno-wizardry, we’re betting the story involves some interesting variations on themes of augmented reality. (The UV trick on the comics page is a pretty good analog to that effect.) But knowing Ellis, you can be sure he thought of uses for this “peekaboo” trick that go beyond easy laffs and obvious thrills. Considering that this is the man whose twisted brain birthed cult hits like Transmetropolitan and Hellblazer, you might want to steel yourself before waving that UV lamp around willy-nilly — you never know what you might not be able to un-see.